Liverpool are mover closer to signing Aston Villa star Christian Benteke after he arrived on Merseyside for a medical, reports talkSPORT. The Reds have agreed to pay the 24-year-old’s £32.5 million release clause, and now the transfer seems to be moving apace. It is unknown if talks over a contract have taken place, but if a medical is going ahead then the move cannot be far away. Brendan Rodgers needs to bring in a major signing to replace Raheem Sterling after the 20-year-old joined Manchester City for £49 million earlier this month [BBC]. 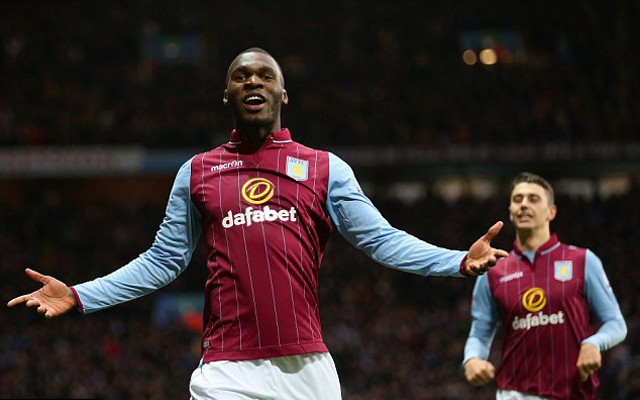 Benteke could be perfect to do that , with the Belgium international hitting 49 goals in 101 appearances for the Villans over the last three seasons. In the last campaign the forward managed to net 16 times in 38 games, but 12 of them came in 15 matches under Tim Sherwood. This streaky nature may be found out at the Merseyside outfit, where players are expected to perform consistently well every week. Rickie Lambert and Dejan Lovren, for example, suffered under the weight of expectation last season after moving from Southampton. Liverpool do need a regular goalscorer though, after failing to hit the back of net regularly in the last campaign. The departure of Luis Suarez to Barcelona and regular injuries to Daniel Sturridge contributed towards this, but with the latter fit again and the addition of Benteke they could make a real push to return to the Premier League top four. While the Reds move closer to sealing the signing of one Aston Villa star, another looks likely to evade them. Fabian Delph-who was previously linked with a move to Anfield [Mirror]-once again looks set to swap Birmingham for Manchester, with BBC Sport reporting that the England international is at the Etihad Stadium for a medical, despite having professed his loyalty to Villa less than a week ago.